I recently read Goodlife is partnering with Dare Cookies. As a physician I am quite troubled by this strange relationship with Dare cookies given Goodlife espouses to promotes a healthy lifestyle. I am in fact so troubled by this campaign that I am seriously contemplating cancelling my membership, Moreover, I could not in good conscience recommend Goodlife given this corporate partnership with Dare. I look forward to your reply in this matter. Regards, Timothy Moran MD PhD"
Thank you for your email message and your concern in the partnership with Dare Cookies. I can understand your concern upon reading such information. There is a partnership in place but not in the aspect you might assume. The partnership is not to promote the cookies but the importance of physical fitness directed towards those who might consume the cookies. On certain types of cookies there will be an offer for a 14 day trial membership to encourage those to attend a facility. I hope this explanation will help ease your mind in Goodlife's intentions. Should you have any additional questions or concerns please feel free to contact us. So I set out yesterday to find a co-branded package of cookies and when I came up short (couldn't find any in our local supermarket), I tried a Google search. "Looking to beat the summer heat? Why not try this cool, wholesome summer treat!" 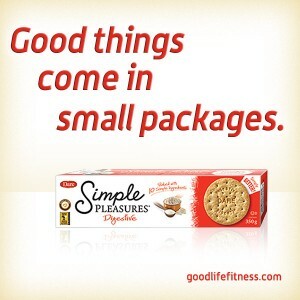 And what's the, "wholesome", summer treat being promoted by Goodlife Fitness? "a few extras for tasting"
"Looking to try other Simple Pleasures cookie flavours? There are 8 in total, all baked with 10 (or less!) simple and familiar ingredients. Choices include Oatmeal, Oatmeal Dark Chocolate, Social Tea, Chocolate Thins, Spice Snaps, Cinnamon Snaps, and Almond flavour. At GoodLife Fitness, we encourage Canadians to live fit and healthy lives which includes a balanced approach to nutrition. This might include having a cookie after playing with your kids. Through our cross promotion with Dare, we are partnered with their Digestive Cookies." And lastly - I must point out that the blog tags included on this post were, "Healthy Living", and "Nutrition". Does this all ease all of your minds about GoodLife's intentions not to sell cookies?